ADSTRA Dental Software is now available as a cloud-based solution for your dental practice. This cloud solution is a safe and modern solution to your dental clinic’s needs. In a day and age where everything you could imagine is available via the cloud – people are often left wondering what the benefits are to buying software, apps, music, movies, and more, in this way. Dental software, and really – all software companies, are striving to develop cloud computing solutions that offer the consumer countless benefits. But what exactly are the benefits to a cloud-based dental software solution? Owning a physical copy of something is a way of the past. What would happen if you were to lose all your CDs? You’d have to go and replace them, right? Now let’s say instead of having physical CD’s – you just purchase and download your music. You can’t lose something if it’s in the Cloud. The same situation can be applied to your data. What would happen if your dental clinic had a flood or a fire? All those paper charts and your computers themselves would be destroyed. Do you have a procedure in place to recover all of your patient’s data now? If your patient’s data was stored on the Cloud – all you would need to do is login from any computer to access it again. The ADSTRA Dental Software cloud-based solution, ADSTRA Cloud, is hosted on a safe and secure remote server. This allows you to have the ability to access your data from anywhere on any computer or handheld device (phones and tablets). 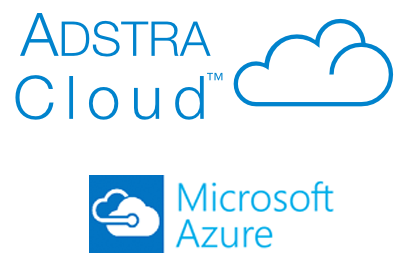 Microsoft Azure is used by many companies, large and small, as the host on their cloud solutions, and ADSTRA Dental Software is one of them. Using advanced encryptions methods and meeting the highest safety standards, Microsoft Azure is recognized as the most secure platform in the world and has methods in place for protecting you against the loss or theft of your data. Working in the healthcare industry – dental providers have access to a lot of confidential information about all of their patients. It goes without saying that they have a duty to protect this information and ensure it is all securely stored. Recently the in the US, The Office for Civil Rights’ sanctioned a private oncology clinic for negligence because an employee had her laptop stolen which contained unencrypted data for 55 000 patients. With a dental software solution like ADSTRA Cloud, this whole situation could have been avoided. Since all of the patient data is not hosted locally on each computer but instead on a safe and secure on a remote Microsoft managed server, the loss of the computer does not the confidential patient data at risk. The ADSTRA Dental Software cloud solution, ADSTRA Cloud – is an affordable solution for dental clinics of any size. Partnered with the security of Microsoft Azure, ADSTRA Cloud is the ideal dental software solution for your dental practice.